While inquiring about the need for a long-arm quilter in our area in a local quilt shop, I was told (in a not-to-friendly tone), “There are 13 home-based quilters in our area and that's enough!” I have been very excited about starting my own business after my Gammill demo and she sure took the wind out of my sails. How do I go about doing market feasabilty without scaring my competitors? Here's my take on how to go about doing a market feasibility study for the machine quilting business in your area. First, make some phone calls to the 13 other machine quilters in your area. You can get these numbers from the phone book or from the local quilt shop (you may want to have a friend get the contact info from the quilt shop so they don't know it's you asking). Do you have an references? Do you know of other machine quilters (if they can't handle the job quickly – gives you more names to call)? the machine quilters are not busy, then perhaps the market is over-saturated. If you do find that the competitors are very busy, and they cannot deliver in a timely manner, then this could be a great opportunity for you to come into the market and dazzle the customers. That is, if you can turn the quilts around for customers sooner than your competitors. Assuming you can, then the first thing to do would be to try and get some publicity for your new business. Push the angle of the over-demand for machine quilting in your area, and that as a new machine quilter, you can do their quilting job much quicker than your competitors. 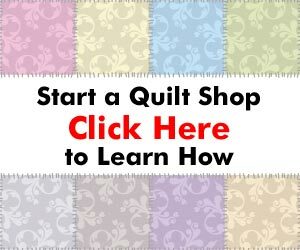 In addition, you should hold an open house where you demonstrate the techniques and materials that you will use if you are chosen for a quilting job. Make it very informal – coffee, cookies, etc. – but also very informative. Talk about the quality of your quilting machine, the techniques that you use, etc. You may also want to differentiate yourself with some kind of marketing spin. Perhaps you can offer a 100% money-back guarantee. Or, you can guarantee that the quilt job will be done in 1 week or less, or you save 20%. Anything that will set you apart. customer. Quilters are artistic, so your materials should look great (again, without overspending). As you gain some customers, ask them for referrals and recommendations. Also, find out where your customers congregate – is there a local quilt guild you could visit or join to discuss your machine quilting business? There are a lot of different things you can do for marketing as your business grows, including Yellow Page advertising, newspaper advertising, postcards, direct mail, etc. But first and foremost, focus on customer service and customer referrals – these are money in the bank. Whatever you do, do NOT undercut the prices of the other quilters. That is a sure way to promote bad feelings and these other folks will not only be your competition, they will also become your support network. Nobody understands what you’re going through than someone in the same field. Next post: How Do I Transfer My Own Designs to Fabric?